Harry Potter and the Half-Blood Prince brings us back to the magical world of Harry Potter, but it ain't what it used to be. The menace of Voldemort has been building steadily for the last couple of movies and by this sixth go-around, it seems most of the color has been drained from the world. There's a storm coming. Looking up into the perpetual cloudy skies and seeing a skull face in the clouds seems to be an everyday thing. Even Hogwarts itself, once a warm and inviting stronghold of wonder and whimsy, has become a gothic fearscape of sinister angles and foreboding shadows. With the ominous dread creeping across the world, it's no wonder all the students of Hogwarts want to do is snog. Yes, lust is in the air at Hogwarts, and love, too, but that's really at least one more movie away. Harry Potter and his wizard chums are now sixteen years old, maturing, increasingly attractive, and they all rather fancy each other. Harry wants Ginny Weasley. Hermione wants Ron. Lavander Brown wants Ron. Cormac McLaggen wants Hermione. Ron wants Harry (well, not really, but the way those two cuddle up next to each other in their bedchambers, one can't help but wonder.) You'd need a scorecard to keep up with it all, much to the chagrin of the teachers at Hogwarts, all of whom seem to roll their eyes at the openingly throbbing loins of their young charges. The most amusing moments of The Half-Blood Prince are the moments of teen lust gone awry straight out of Archie Comics, such as when Ron eats enchanted love chocolates meant for Harry and falls in lust with its sender. This leads to Ron being poisoned and hospitalized, where his semi-conscious spouting of Hermione's name is all Hermione needs to validate her unrequited love, which in turn shatters the hopes and dreams of Lavander, the girl Ron was snogging for no reason other than, well, a young Quidditch stud's gotta snog someone. This teen drama plays out right in front of their bemused professors Snape, McGonagall, and Dumbledore. Dumbledore seems especially interested in the days of their lives, quizzing Harry about whether he and Hermione are sharing bedknobs and broomsticks and, like us, finding himself a little disappointed in the answer. Dumbledore has more pressing matters in mind and, as in the book, the main action of The Half-Blood Prince involves Dumbledore and Harry going on psychedelic trips down memory lane to unlock the mystery of Tom Riddle, the creepy little boy who would become Lord Voldemort. Notably absent are references to Tom Riddle's parents, which are interesting but not necessary, as what the movie is primarily focused on is introducing the horcruxes, seven enchanted items within which Voldemort hid pieces of his soul. Destroying the horcruxes, which is to become the Holy Grail quest for the remainder of the Harry Potter saga, means destroying Voldemort once and for all. The mystery of the horcrux is hidden in the mind of Slughorn, the newest professor at Hogwarts, who once taught Tom Riddle, and has a thing for collecting students of high achievement as personal trophies. Harry's mission this year is to buddy up with Slughorn and somehow extract the memory from his mind, which Harry royally bungles. Luckily, Harry has his old friend Hagrid ready and able to get Slughorn right pished, so Slughorn voluntarily and guiltily surrenders his memory. What didn't quite make sense was why this memory was worth all the trouble. Dumbledore seemed to know what the horcruxes were anyway. He already had two from previous movies and had a line on finding a third. It seemed like all Dumbledore really needed was the word "horcrux", maybe so he knows what to call the things Harry would have to collect when his master plan kicks into gear. There's all this other stuff going on as well in this busy movie. Harry and Draco Malfoy still loathe each other on sight. Harry spends a lot of his free time shadowing Malfoy around Hogwarts, overhearing incriminating bits of sinister confessions of misdeeds and doing nothing about it. Malfoy is able to spend the many months of the school term wandering around Hogwarts alone throwing birds into a cabinet, all part of his super-secret mission given to him by the Dark Lord himself. No one even feigns surprise when Draco reveals himself to be Dumbledore's would-be assassin. Meanwhile, Harry discovers a mysterious book that turns him from a perpetual C-student into the hottest young academic prospect in Hogwarts. Harry Potter suddenly becoming a wizard at wizardry doesn't seem to cause any of his teachers, who know his mediocrity better than that, to raise an eyebrow, but it briefly annoys Hermione, until the subplot of who the "Half-Blood Prince" is stopped cold for a good hour. Snape suddenly blurts out, "I'm the Half-Blood Prince!" at the end. Oh right, that was a mystery of some sort, wasn't it? The best moments in The Half-Blood Prince are the entertaining little character touches and action spectacles deviating from what's in the book, such as when Hermione smacks Harry on his swelled head with rolled up parchment for bragging about being the Chosen One. Harry is hit on by an attractive waitress in a diner at the start of the movie and even Dumbledore offers his regrets that he couldn't allow Harry to pursue that course of action. "I'd like to let you hit that Harry, but the book says we have a lot of walking down memory lane to do." The attack on London that opens the movie, to no consequence that the movie deals with, is a great visual, as is the all-new sequence of the Death Eaters' torching the Weasley house. Other changes seem to undercut what would otherwise be more important, crowd-pleasing developments. In the book, Harry wins a Quidditch match, sweeps Ginny off her feet and kisses her in full view of his Gryffindor mates. The movie has their first kiss as a secret rendez vous, establishing that their destined future together will see Ginny as the one who wears the pants in the Potter family, bossing the Chosen One around, and Harry will like it. By not showing the students attending any classes besides Potions with Slughorn, the boiling-over tension between Snape and Harry is completely undercut, relying on their dislike for each other from previous movies to fuel Harry's rage when he sees Snape do what Draco couldn't. As a visual spectacle, The Half-Blood Prince lets us down at the most important moment: when Harry and Dumbledore go on a mission in the Inferi cave to retrieve the third horcrux. The muted color palate and murky visual effects rob us of much of the terror of the Inferi, zombies living in a bottomless lake guarding the horcrux. The movie relies on the Boo Machine of a hand darting out of the water at Harry for its primary scare, but when the Inferi emerge from the lake, they look like unfinished animatics of Gollum from Lord of the Rings. There's a nice shot of Harry being pulled into the depths of the lake, but otherwise, this was supposed to be the pulse-pounding sequence of the film and it doesn't deliver. The sequence is totally underwhelming compared to what we've been treated to in the past: the battle in the Ministry of Magic in Order of the Phoenix or Harry's trials against the dragon and the mer-people in The Goblet of Fire. Everyone by now knows this is the chapter in the Harry Potter saga where Dumbledore takes the long dirt nap. The entire story builds towards Dumbledore's master plan that he has to die in order to set Harry on the course to accomplish his great mission. Of course, having read all the books, we know what Dumbledore meant when he urged "Severus, please". We know this is coming, we're steeled for it, but it's the movie's job to bring forth all the emotion of Dumbledore's ultimate sacrifice. This is the pivotal moment, the privotal death in the Harry Potter universe, and it plays as an afterthought. There's little emotion, little outrage, virtually no sadness. As with Sirius Black's underwhelming death in the previous film, Dumbledore's death is limp and inert. 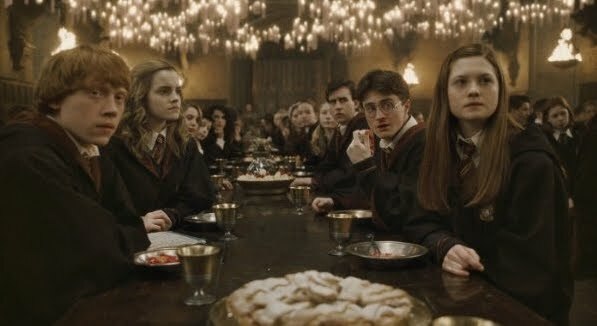 The students gathering over the corpse of their beloved headmaster weren't nearly as emotional as they were when Cedric Diggory died in The Goblet of Fire. (And boy, would the ladies of Hogwarts like to meet Cedric now that he's a vampire.) In addition, we weren't shown the magnificent funeral for Dumbledore, where all the magical creatures in the Hogwarts forest and lake paid the great wizard tribute. No tears for Albus Dumbledore, though. Everyone at Hogwarts must have already read book seven. By now, Harry Potter movies have an established level of quality to be expected. The Half-Blood Prince meets that level but nothing more. This is a servicable adaptation with a few novel twists and entertaining tidbits, but otherwise, it's more of the same from what was established by director David Yates in The Order of the Phoenix. The Half-Blood Prince is two hours and forty minutes in length and the audience feels every bit of it. Scenes are stitched together like patchwork and there's practically no forward momentum driving the movie's story. The young actors we've watched blossom in these roles, Daniel Radcliffe, Emma Watson, and Rupert Grint (who is the MVP for comedy this time around) retain and build on their considerable charm while the older guard remain venerable and reliable, with Michael Gambon delivering his finest work as Dumbledore. Odd British humour is mixed in with the gloom and doom, welcome bursts of action are thrown in, familiar Potter universe characters show their faces and wave hi to the camera to remind you they're still around, and it's all well and good. But not magical.